Survivor: Heroes vs. Healers vs. Hustlers' merged Solewa tribe voted out Ashley Nolan during Wednesday night's episode on CBS. 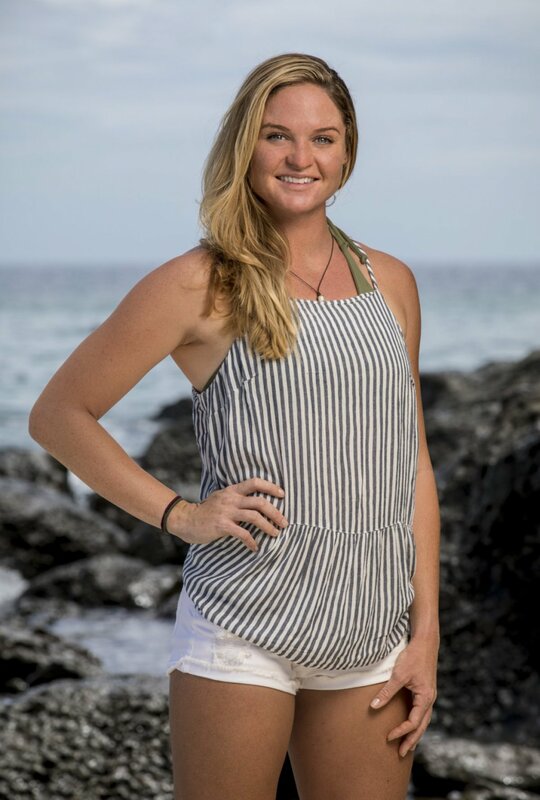 Ashley, a 26-year-old lifeguard from Satellite Beach, FL, became the thirteenth person voted out of Survivor and the sixth member of the Season 35 jury on Night 36 of the game through a 5-1 vote at Tribal Council. Mike Zahalsky, a 43-year-old urologist from Parkland, FL, earned himself one vote from Ashley. Although Ben Driebergen, a 34-year-old U.S. Marine from Boise, ID, was the real target, he had played another hidden Immunity Idol to keep himself safe. "Thirty-six out of 39 days, I couldn't have gotten much closer than that," Ashley said in her final words. "[Devon Pinto] completely went against the alliance that we had. I think there's hard feelings still for the moment, but I did a lot better than I ever would have imagined. This whole experience has given me a brand new outlook on life, and I couldn't more grateful for that." The Survivor episode began on Night 33, with Ben bragging about how he had intentionally painted a target on himself at the previous Tribal Council so everyone would vote for him and he could play his idol and take Lauren Rimmer out. Ben was so excited his plan worked, but the rest of the tribe agreed Ben needed to go next. Ryan Ulrich admitted to his tribemates that Ben was "amazing," a "really amazing" player. Devon also thought it was "really messed up" that Lauren went home. As for Chrissy, she announced that someone other than Ben needed to win Individual Immunity to ensure he'd go home. Devon told Ben that he should've voted himself out because he'll steal immunity from him going forward. Ben acknowledged he had a long, hard road ahead of him. On Day 34, while everyone was sleeping, Ben began his quest for an idol. While gathering wood, he looked everywhere. And when Chrissy woke up, she realized Ben was gone and he was off searching for one, but she was pretty convinced he wouldn't be able to find it. The Solewa tribe then met Survivor host Jeff Probst for a Reward Challenge. Divided into pairs by random draw, the castaways were required to attach themselves to a rope that was woven through a series of obstacles and then run through the obstacles and attempt to land five rings on a target. The winning pair would be taken by helicopter to a private resort on a private island, where they'd enjoy lamb, chicken, lobsters, cocktails, chocolate mousse, and a good night's sleep in an actual bed. The random teams were Ben and Ashley vs. Chrissy and Devon vs. Ryan and Mike. In the end, Devon and Chrissy won Reward, and Jeff allowed them to choose one person to join them. Devon and Chrissy asked Jeff if they could have a minute to talk things over, and once that time was granted, Chrissy noted that Ryan would be the best choice. Devon quickly agreed, and Ashley appeared surprised and disappointed from a distance. Ashley pointed out with frustration in her voice that it was interesting to see who makes the decisions in the tribe. Chrissy didn't appreciate the comment at all. While three players enjoyed Reward, Ben hoped to work on Ashley back at camp since she was "hangry." Mike was also vulnerable to Ben since he was complaining about why Devon and Chrissy didn't take him on the Reward since he's in the middle of two pairs -- unless Devon was trying to flip Ryan back to him. Mike also vented about how Devon was "the least deserving" of the meal because he recently ate and has a youthful stamina. Although Ben tried to convince Mike and Ashley to join him, it didn't work. Mike admitted to Ben that he was still next, and Ben was annoyed that Mike constantly threw him under the bus. Ashley spoke up and agreed that Ben couldn't be taken to the Final 3. Because of Mike's behavior, Ben decided that the doctor would be his next target. Ben told Ashley that Chrissy and Ryan were gunning for her and Devon, but it didn't mean much to Ashley coming from the guy on the bottom of the tribe. Ben said his conversation with Ashley was like "talking to a brick wall," so he continued to look for an idol. Mike, however, had been looking for an idol himself, and since it was nowhere in sight, he wasn't worried about Ben finding it. On Reward, Ryan, Chrissy and Devon agreed Ben needed to go next, followed by Mike because he was so unpredictable. Chrissy then suggested they solidify a Final 3 alliance, and Devon felt good about that. Even though he had rough times with Ryan, Devon thought he could get to the end with the two of them and then beat them both. Ryan also said in a confessional he'd love to go to the end with Chrissy and Devon, mainly because they were the two people closest to him in the game. Chrissy seemed most excited about the fact she was going to break up Devon's alliance with Ashley. Chrissy also wanted to take out Ashley for calling her out at the previous challenge. In fact, Chrissy wondered if it made sense to eliminate Ashley before Ben in order to keep herself safe. On Day 36, the tribe met Jeff again for the next Individual Immunity Challenge of the season. Each castaway was instructed to race through a series of obstacles to a sack of sandbags and then toss a bag into a basket, releasing a set of ladder rungs. The players had to climb up the ladder and then use a ball to release another set of ladder rungs. Once at the top of the structure, each castaway had to solve a puzzle. Chrissy -- who has proved herself to be excellent at puzzles -- won Individual Immunity, and Ben confessed it "hurt" because he was "100 percent sure" everyone was targeting him. After the challenge, Ashley assumed Ben didn't have an idol, but in case he did, she thought it would be a smart move to split the vote. Based on what happened at the previous Tribal Council, one vote could send a person home. Ashley therefore talked to Ryan, Devon and Chrissy about putting votes on Mike as well, and in the case of a revote with no idols in play, Ben would go home. But Chrissy still thought Ashley was gunning for her, so she told Ryan, Mike and Devon that she wanted Ashley gone. Chrissy said the move would still flush Ben's idol if he had one and there were two more Tribal Councils before the Final 3 to eliminate Ben. Mike argued, however, that he was too nervous to keep Ben around any longer. Ryan seemed to agree with Mike that Ben needed to be their top priority, and Devon really liked Ashley and thought it would be crazy to take her out before Ben. Devon believed that if anyone was in the Final 3 with Ben, no one would stand a chance. Shortly before Tribal, Ben found a clue to a hidden Immunity Idol, and he learned the idol was buried underneath the tribe's shelter. Ben had every intention of grabbing the idol before Tribal, but he didn't know how he was going to snag it without anyone noticing. At Tribal Council that night, Ben announced to the group that Mike was the swing vote between two pairs. Chrissy pointed out that Ashley's comment at the Reward Challenge was "poor sportsmanship," and Ashley promised that she didn't mean that in a negative way. Jeff then asked the castaways if they had a Final 3 alliance already, and everyone said "yes" except for Ben, who was willing to go to the end with anyone who would have him. Ben joked that he was "open for business." Mike then told Jeff that there was a possibility Ben could get his way at Tribal Council since he was very "smart and tricky." With that being said, Ashley worried a plan was in effect that she didn't know about. Ben acknowledged that coasting through the game of Survivor might get you to the end, but it won't win you a million dollars. "I truly think Ben is going home tonight," Devon said shortly afterwards. But Ben took Devon's comment as a challenge, and so the former Marine took out his idol necklace and placed it around his neck. Devon said that just because Ben took out his idol doesn't mean he's going to play it. Regardless, Ben was really proud of himself and acted like he had just blown up the game -- a comment Chrissy quickly shot down. Chrissy acted like it was no big deal Ben played another idol. In order to prove he wasn't messing around, Ben handed Jeff the idol before the Survivor host even asked for it. Ben then told Ashley and Devon that if they wanted to return to camp after Tribal Council, they should vote for Mike. Whispers then broke out between pairs of players, and Ben was so pleased with himself to have turned the five against themselves. Jeff then read the votes in the following order: Mike, Ashley, Ashley, Ashley, and Ashley. "I can't believe this," Ashley said. "You guys are crazy." Ben hugged Ashley goodbye, but when Devon tried, Ashley walked away from him and just said, "I'll see you." Devon was well aware at that moment that Ashley was angry with him.